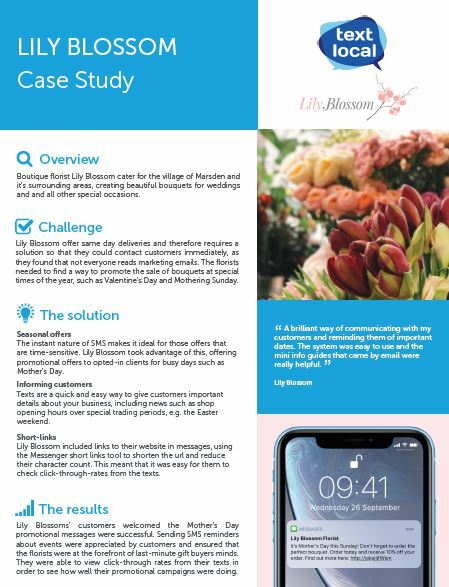 Lily Blossom offer same day deliveries and therefore requires a solution so that they could contact customers immediately, as they found that not everyone reads marketing emails. The florists needed to find a way to promote the sale of bouquets at special times of the year, such as Valentine’s Day and Mothering Sunday. Seasonal offers The instant nature of SMS makes it ideal for those offers that are time-sensitive. Lily Blossom took advantage of this, offering promotional offers to opted-in clients for busy days such as Mother’s Day. Informing customers Texts are a quick and easy way to give customers important details about your business, including news such as shop opening hours over special trading periods, e.g. the Easter weekend. Short-links Lily Blossom included links to their website in messages, using the Messenger short links tool to shorten the url and reduce their character count. This meant that it was easy for them to check click-through-rates from the texts. Lily Blossoms’ customers welcomed the Mother’s Day promotional messages were successful. Sending SMS reminders about events were appreciated by customers and ensured that the florists were at the forefront of last-minute gift buyers minds. They were able to view click-through rates from their texts in order to see how well their promotional campaigns were doing. A brilliant way of communicating with my customers and reminding them of important dates. The system was easy to use and the mini info guides that came by email were really helpful.